Justine Kim (left) and Sky Patterson speak during ASG Senate. The two juniors announced their candidacies for ASG president Tuesday. 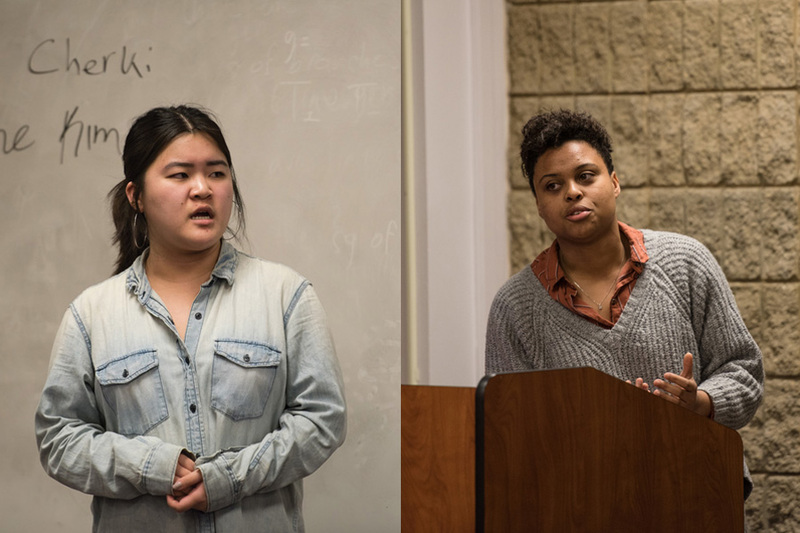 SESP junior Justine Kim and Weinberg junior Sky Patterson announced their campaigns for Associated Student Government president Tuesday. Kim served as parliamentarian before stepping down to avoid a conflict of interest with her campaign. She has also served as the executive director and outreach chair of the Korean American Student Association. Her running mate is SESP sophomore Austin Gardner, ASG’s vice president for accessibility and inclusion. Patterson is the ASG vice president for academics. She has served as the Leader of the Left in Political Union and as a member of Students for Sensible Drug Policy. Patterson’s running mate is Weinberg junior Emily Ash, ASG’s vice president for public relations. Kim and Gardner, who will release their platform Wednesday, are running on the pillars of health, amplifying student voices, funding reform and increasing student-based choice. The overarching theme of their campaign will be student equity, Kim said. Her campaign hopes to target ASG structure, Kim said, adding she hopes to create long-standing policies that continue to work beyond the tenure of the students who pass them. Kim said she and Gardner plan to spend the campaign meeting students and listening to their needs. Patterson and Ash launched a campaign website Tuesday night, where they published a multifaceted platform. Patterson said the three “spheres” of her platform are wellbeing, community development and academic equity. Their website lists a series of promises and initiatives in categories ranging from course affordability to campus alcohol policy. Patterson said these policies aim to target inequality on campus. According to Patterson and Ash’s website, their campaign will advocate for policies that Patterson has been involved in introducing and expanding, including the Books for Cats initiative and CTEC survey reform. Patterson said she and Ash plan on meeting a variety of student groups and individuals in addition to hosting campaign events, including a launch party Wednesday. After last year’s uncontested election, both candidates said competition will positively impact the race. Patterson said the lack of opposition last year contributed to decreased interest, and that she is excited to be part of a contested election. Kim said students tend to feel a greater sense of engagement when an election is contested, and that past ASG elections that were highly contested saw the greatest turnout. Election commissioner Dillon Saks said there will be three debates next week. ASG will host a debate on April 9, The Daily will host a second one on April 10 and the Coalition of Colors will hold the final one on April 12. Voting will start at 5 p.m. on April 12 and will remain open for 24 hours. Saks, a Weinberg sophomore, said having a contested election this year will make it more “interesting” than last year. “We’re hoping that this will lead to increased turnout and increased student participation in this election, because we believe that it’s important for the Northwestern student body to be invested in what is going on with their student government,” Saks said. Correction: A previous version of this story misstated what wellbeing, community development and academic equity are to Patterson and Ash’s campaign. They are the three “spheres” of the campaign. The previous version also misstated one of the pillars of Justine Kim and Austin Gardner’s platform. One of the pillars is funding reform. The Daily regrets these errors.